I’m still working on Lucinda Smith‘s family. What a horrible, tragic mess. Her husband, Hugh, was burned to death at the age of 52. Thomas is Hugh’s son from his first marriage. He was just 55 when he died. If you can’t read it, the primary cause of death is multiple metastaces of melanotic carcinoma (primary on skin of neck). Contributory cause is fracture of eroded cervical vertebra by chiropractic adjustment. I wonder if he knew he had cancer before going to the chiropractor? What an awful way to go. And it wasn’t quick, either. His neck was broken in December, but he didn’t die until February. Another daughter from Hugh’s first marriage, Isabelle, was married off at 16 years old. She had one son. 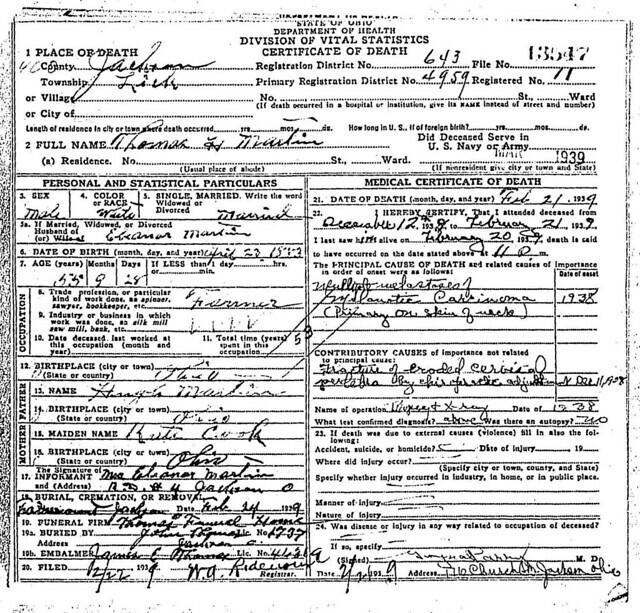 I can’t find any death information for her, but if the information on her husband’s Findagrave memorial page is correct, she died quite young. And look at husband Albert’s headstone. It’s one of those concrete grave markers that are super common in this area. The family must have been incredibly poor. 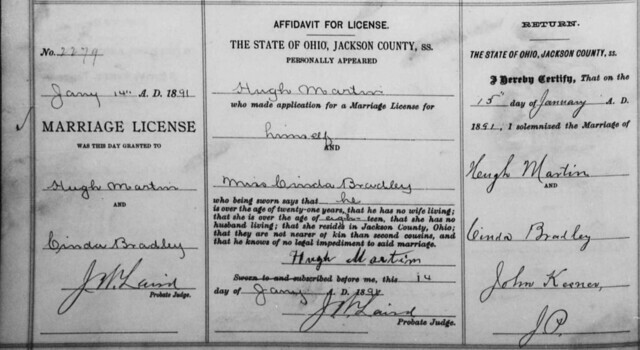 If you look closely, you’ll see that Lucinda married Isabelle’s father just a few months before Isabelle herself was married off. I really wish I knew what the story was behind this. 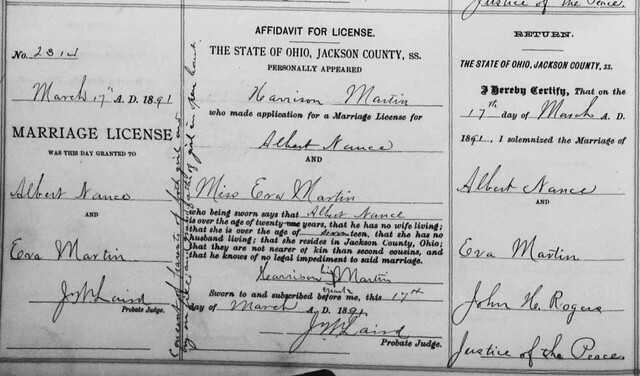 I don’t know if you can make out the notation on Isabelle’s marriage license, but it says: “Consent of parents of both girl and boy on file and grandfather of girl in open court.” So neither Hugh nor Lucinda were present at the wedding. I wondered if it may have been a shotgun wedding, but looking at the birth date of their one and only child, that seems unlikely. Robert Nance was born 22 Oct 1892, more than a year after his parents’ marriage. It’s possible there was and earlier pregnancy that didn’t come to term, but there’s no way to know.